I was actually in Miami the first time I ever saw a sign for the 5-Guys Burgers and Fries franchise. The chain is nationwide, yet it is also critically acclaimed for fresh food and clean surroundings. The burger-joint started with an open kitchen and clean interior. 5 Guys does not skimp on this, featuring the cleanest bathroom I've ever seen in a fast food restaurant. The menu remains simple; burgers, fries, and hot dogs. The portions are generous for a cheap price. Every location also offers free peanuts (because everything fried is done so in peanut oil). The burgers are freshly cooked and made of high quality beef. The buns are so-so, but 5 Guys offers a generous amount of free toppings (except cheese :( ). They were nicely griddled, but I'm more accustomed to eating freshly grilled burgers. Still, the portion was nice and a regular burger (with 2 patties) easily satisfies. 5 Guys is famous for their freshly cooked french fries. Every order is served in a bag with the fries overflowing. They fresh idaho spuds have a clean taste because of the peanut oil. I haven't tried the optional 'cajun spice', but they could only make the meal tastier. 5 Guys and Fries produces a better bag of french fries than a burger, but the burger is still good for the price. There's definately worse food to eat, but a bag of fries are just good walking around food when trekking around the massive Patriot Place complex. I would prefer grilled burgers and perhaps cheaper cheese, but then I get so many other vegetables on my burger I suppose it does not matter. Arcades have died out in American culture. The surviving entertainment complexes have required an extra gimmick. Dave & Busters (named after the chain's owners) offer American food with an open bar and full arcade to pull in customers. Yes, the food is similar to that of the other big chains, yet the draw of playing skeeball or a racing game draw in the customers. The customers are not just children. The interior resembles a bar from the early twentieth century. The entire complex is well planned with restrooms and easy access to food and drink. It would be easy to rate the entertainment portion (including karaoke, virtual golf, many pool tables, and yes many arcade and video games), but the food is what I was after. They offer the same medium-fare found at other chains (you know the ones), but many of the meals include credits to play their video games. This is seductive, but how does the food they offer with this combination stand up? One such entree is their grilled salmon fillet with citrus rice and sauteed haricot vert. The fillet was a nice portion and perfectly cooked (something some ocean-side restaurants often mess up with grilling). The sides were decent, though they provided a nice contrast to the salmon's flavors. Another entree featured a nice sirloin steak with a loaded mashed potato. This is a common meal and there was nothing exceptional about it. The steak was a nice cut (though Outback still wins for best chain-restaurant steaks) and was cooked to temperature. The potato was basic, providing a good carbohydrate boost for later playing. Desert was unique with a fondue sampler. It was nice to receive one of these with actual melted chocolate and a small tea light to maintain a nice warmth. Alongside the selection were sliced strawberries and bananas, pound cake, small brownie chunks and rice crispy treats. Not as good as Melting Pot's fondue, but Dave & Busters produced a nice desert for a romantic meal. Dave & Busters is a venue best saved for adventurous dates filled with fun and games. The food is good for what it is, something other restaurants without pinball can often fail at. It produces a good date venue capable of entertaining children or breaking the ice on a blind date. In the western reaches of Mineral Spring Avenue in North Providence sits a gourmet Italian bistro. Wild Fire serves fresh wood-oven pizza, pastas, and they have a full bar. The restaurant celebrates several specials to entice quicker visits. Every Sunday they offer an Italian Chicken dinner. Every Monday, it's all-you-can-eat pasta. Every Tuesday all large Pizzas are half-off. The weekdays have happy-hour specials from 4pm to 6pm featuring a cheap menu. Inside, Wild Fire features dark woods and impressive lighting. The dim surroundings do not betray uncleanliness. The interior possessed a pleasant atmosphere. A pleasant hostess greeted us and sat us at a lovely table. We were quickly served with excellent service and were presented a wonderful meal. The best indicator of pizza are the rolls served before the meal. Wild Fire served wood-fire baked rolls with lovely garlic-infused olive oil alongside dried pepper flakes and freshly grated parmigiana regiano cheese. This in itself provided a wonderful start for an early afternoon pizza. A wonderfully cooked pizza emerged from the kitchen. The waitress suggested a wonderful chianti to complient the pizza. The 'Genoa' featured fresh sauce and buffalo mozzerela cheese topped with a fresh basil chiffonade, freshly cut Genoa salami, and shredded asiago cheese. Its flavors complimented everything wonderfully producing a pizza that cannot easily be topped. Everyone worked perfectly. Wild Fire is the perfect proof of why pizza should be cooked above fire. We enjoyed a wonderful meal. Me and my wife look forward to returning for a more intense meal. Wildfire has a full website complete with menus. Situated in the Franklin Shopping Center is a small Japanese restaurant (featuring Chinese cuisine also) called Teppanyaki Asian Cuisine. The true name for flat-iron cooking (hibachi means something else), the interior looked like many other Benihana clones. The interior was also filled with Polaroids of previous customers enjoying themselves, a nice touch but an indicator this would not be gourmet cooking. Not bad, but could use some interior improvements and more cooking. There was some potential, but they overcharged for boring Japanese food. The sushi and soup were great, just everything else needed more work. I would maybe eat here again, but only if I heard things improved. Luxe Burger Bar is a new Providence hot spot nestled on Memorial boulevard. The concept is an established American tradition, comfort food headlined by burgers, but the execution is nothing but professional. The interior is nice a modern, and the restaurant has a lovely outside seating. Luxe serves various appetizers, hot dogs, a macaroni and cheese selection, and of course; Hamburgers. Hamburgers are the restaurants namesake and they celebrate them with a custom blend of Hereford cuts. The combination is wonderful and is perfectly seasoned and flavored. For anyone who has had Hereford beef, you'll taste the steak. To those who haven't had Hereford beef? GO GET SOME! You build your burger using a pre-printed pad with the ingredients listed. Sure, they have some of their own custom selections, but making your own is so much better. The taste is marvelous. I ordered a Gold-label beef burger (their Hereford blend) on a wheat bun with Havarti cheese, baby spinach, caramelized onions, salsa, and guacamole. The combination was delicious! My wife ordered a plain Gold-label burger with American cheese on a sesame seed bun, though she ordered hers medium-well in opposition to my medium-rare. Her burger had a wonderful char that accented the cheese nicely. Also, with every burger comes a side of fries. I chose sweet potato while my wife picked Idaho potato. They were both delicious and we shared them with equal joy. We ordered the cupcake duo for desert, and were surprised to have a rather good pastry. The duo consisted of a devils-food cake topped with an dulce-de-leche frosting, though it was more of a chocolate one. The other was a red velvet with cream cheese frosting. Both were decent and helped to close a wonderful dinner. One downside is the addition of a 'Kobe Beef Burger', a trendy addition to many menus, but the idea of grinding the perfectly marbled steak created in the 'Kobe' style seems like a sin. Also, many restaurants and markets sell 'Kobe Hamburger' that is nothing more than regular hamburger with more fat. Settled across the street from the Lincoln mall sits the Trattoria Romana. This is not a review of the main restaurant, but the 'express' cafe next door. These have become popular with restaurants. They offer the same quality of food offered cheaper and quicker. Me and my wife decided to eat here. We sat down at the small tables adjacent to the large deli case. This case was filled with pastries, Italian foods, and deli meats. The walls were covered with jars and bottles of various foods, giving the atmosphere of a true deli, even though this was more of a quick-eat cafe. They offer everything from a simple coffee to gourmet pastries and breakfast sandwiches. The plate we ordered was nice meal. We ordered a simple cheese pizza for the meal. It was delicious, but lacking. The crust was perfect. The sauce, amazing. Our only problem was the cheese. It tasted more like microwave oven pizza cheese rather than real mozzarella. We looked at the menu again, and while the pepperoni offer 'authentic buffalo mozzarella', the cheese only listed 'shredded mozzarella cheese'. The cheeses tasted fine, but then they didn't taste good enough. I would have prefered the goey and stringy authentic mozzarella to a bagged cheese which left the pizza a little greasy. Next time we go, we're definately ordering a pepperoni pizza sans the little disks. Ice cream during summertime epitomizes comfort. The design and production of perfect ice cream is a difficult thing. We live in a society that produces Vanillin faux-vanilla Ice Cream smothered in cheap chocolate syrup. When you want a decent ice cream at home, you usually have to shell out more than it's worth for a pint. It never really fits summertime, enjoying the weather and beautiful nature of sunny New England. The Ice Cream Machine, across from Diamond Hill Park, feels like it sits out of time. It could easily be there now during the iPod age as it was back in the 1970s. It's an outdoor stand with nice wooden picnic tables scattered throughout the property. It looks like every other ice cream stand seen on the various routes and roads throughout New England. To assume that, you should really stop at this one to find out it's a wrong assumption. First, be prepared for a line wait, this occurs even though there are 4 lines. People know of this stand's quality and desire it so much, they are willing to wait; a good sign. This is complimented by the hand-written signs. Plain and amateurish? Nah, they put their energies else where. The ice cream flavor board is covered in over thirty falvors and varieties. Unfortunately I haven't tasted every flavor and variety, something I plan to fix within a couple of years. Order whatever, especially since you can get free samples. My personal favorites are the Cinnamon (it tastes like cinnamon roll filling, delicious), peanut butter (so accurate you'd swear it should stick to the roof of your mouth), and the dulce de leche. My wife swears by their brownie batter, she hasn't ordered another flavor (though she loves to snag some bites from mine). They also sell cookies and brownies to enjoy with the treats, which are fresh baked and delicious. One thing we have to try is their 'Diamond Hill Sundae', which for over 11 dollars should be an epic eat. Prices are reasonable, expensive than other stands but you do pay for quality. Two small cones (small is their label, you won't be left wanting) comes out to 8 dollars with tax. They offer either cones or bowls for the basic level, and produce some of the largest sundaes I've ever seen topped with a mountain of whipped cream. Enjoy a personal dish or share some, this stand will leave you wanting more. The Ice Cream Machine has a wonderful website http://icecreampie.com/. Please remember they only take cash, and tip your server! Mexican fast food has a stigma in modern society. Many legends persist involving mystery meats to foodbourne illness to deter people from enjoying a quick taco. The modern fast food movement contains a restaurant to dispel all these myths and produce a high quality and delicious Mexican meal. That restaurant? Chipotle. Inside, you are confronted with a modern White Castle layout; stainless-steel and an wide open kitchen. The menu is simple; a style (burrito, taco, soft taco, or rice bowl), a protein (chicken, beef, pork, or vegetarian), and then a topping bar including pico de gallo, authentic Mexican sour cream, and guacamole. Another feature that sets this restaurant apart from other chain Mexican restaurants, beer and margaritas. They also boast a large collection of authentic Tabasco sauce at the tables. The food just tastes amazing, though be warned it is spicy. This is to be expected for a restaurant named after a smoked jalapeno. The flavors are all there. Their rice is cooked with cilantro and lime. Everything melds together to form a filling and relatively cheap Mexican meal. Consistently rated the top eatery in the Providence area, Pastiche retains that reputation through quality. Its unassuming location off Atwells hidden by the best parking area makes it easy to miss, but you shouldn't. Not now, not ever. The dining room is a small and intimate one, but the service is exceptional. Me and my wife sat down and wanted a snack, which we soon discovered was impossible. We first ordered coffe, her a Latte Macchiato and I a cafe Americano. Both were wonderfully rich and perfectly prepared (too many people just mess up the finer coffees). The sizes were great compared to the price, especially considering other places would triple charge for a smaller portion. We then ordered our 'snack', choosing summery dishes. I ordered a raspberry blueberry tart. When it came out, it looked like a great slice of blue berry pie topped with a single raspberry. I was concerned, until I saw the brilliant red swath of raspberry coolie. The tart shell was the best I've ever tasted, and the blueberrys sat atop a perfect custard, and I don't even like custard that much! The true star was the fruit, the blueberries were perfect, sweet and tart, plump and juicy. All together, it made me enjoy the summer. My wife ordered a lemon velvet cake. What came out looked like a disk of sunshine next to a cloud of real whipped cream. We've been to very high-end bakeries and been served cool whip, so this was a very welcome surpise. On top of the zen-balance of lemon and cake was a small glaze, which just accentuated the lemon flavor. We ended up taking some of the raspberry coolie from mine and putting it ontop of the cake, something the waitress commented was a good idea. It totally was. After both offerings, we were too stuffed to try something else on the hill and retreated happy and full. The Beef Barn is a landmark to Northern New England Cuisine. This does not mean that it is necessarily good. For a quick bite to eat, it seemed like a good idea. Me and my wife ordered the sandwiches and immediately the dinning room felt dirty. We sat and noticed open wells of condiments. Not very sanitary. Our food arrived, and it was nothing special. The roast beef was overcooked. The chew was tough also, and the stringiness left that horrid feeling inbetween the teeth. Because of this, the meal just never came together. The food was cheap, and others seemed to like their meals, but we did not. Good Thai cuisine is something rare outside of South East Asia. I first heard of Thai Garden from my brother. He told me that Thai Garden served fresh, delicious food that was both high quality and affordable. Me and my wife ventured to the small location hidden away across the street from the famous Chan's Chinese. At first glance, it looks like a hole in the wall that would serve mass-produced Chinese food. First impressions are sometimes wrong. Mine was. We stepped into a very quaint dinning room, where the husband is the host/waiter and the wife is the chef. We ordered Chicken Satay, Chicken Rice, and an order of White Curry and a side of sticky rice. The meal was amazing. First, the Chicken Satay was as good as I've had it, served along with a wonderful peanut-cucumber sauce. My wife ordered the Chicken Fried Rice, which in itself sounds ordinary. The flavors were perfect and the mix of fresh vegetables, nice tender chicken, and fluffy white rice just accentuated the overall taste of the dish. My White Curry featured a rich coconut sauce served with chicken (we were in a Chicken mood), and contained a nice mix of fresh vegetables, pineapple, and peanuts. We ordered a side of sticky rice because we are suckers for it, and it was perfectly executed. Thai Garden looks unimposing, but it's genuinely a delicious place to eat on the cheap. I hope these immigrants realize the American dream and secure a larger establishment to feature these wonderful recipes. Thai Garden is located on 280 Main Street in Woonsocket, Rhode Island. A former resident of Miami, Providence's offering of Spanish-Carribean food intrigued me and my wife. She is Puerto Rican and a very picky eater. The lure of the original location trumped the ease of parking offered in Providence's West Side. The restaurant itself is in a former textile factory. Fitting, giving the communist theme of the workers rising. We each ordered from the Tapas menu, though it seemed more of just an ala carte menu (tapas sounds more ethnic?). I ordered the tostones (double fried plantains, squished between frying) with a garlic sauce and the ropa vieja (shredded beef in a garlic and tomato sauce). My wife ordered the quesadilla (a Mexican-American dish? again, sounds ethnic) and the rice and black beans. The iced tea I ordered with the meal tasted off, but I honestly wanted birch beer that was on the menu yet they did not serve anymore. The plantanos were delicious, as good as I have tasted from Cuban and Puerto Rican kitchens. They were dusted with adobo seasoning, a salt-pepper-garlic-oregano mix common in carribean cooking. The garlic glob was unappetizing and it looked visually like something you'd rather not see near food. The ropa vieja stole the meal with both me and my wife devouring both the perfectly cooked and seasoned meat and the succulent broth. The dish was served stew-style with some slices of Cuban bread. My wife is a cuban bread snob, yet she loved the freshness and it was also dusted with some adobo. Her Quesadilla was quite delicious, despite looking like it was filled with cheddar cheese. The unknown cheese inside was actually tasty and reminded me more of macaroni and cheese. Thankfully, the tortilla was perfectly griddled with that nice crispy outside. The rice and beans showed some amateur cooking. The rice was fine (if it wasn't, I'd have burnt the establishment down since miscooked rice is a cardinal sin), but the beans had several problems. First and the worst was they weren't properly soaked, so they were a tad hard. This created a texture problem that conflicts with traditional dishes of rice and beans. Secondly, the seasoning just tasted... well off. It missed something we could not put our fingers on. Finally, they weren't saucey! What little jus from the beans just sucked up into the rice. Normally, the beans possess a thick sauce that the rice has difficulty sucking up. It wasn't a total loss, since the dish also came with some delicious Cuban bread. Despite a few misteps, Cuban Revolution reminded me of Miami. The restuarant itself reminded me of the openair clubs common on calle ocho and the food was really good. We both want to return to try their famous sandwiches. The ropa vieja is just perfect and better than most I've had (aside from my mother-in-law's, who makes a flawless dish). Hidden deep within Woonsocket is an unassuming bar off Mendon road. Across the street is a large vacant lot, and they fill it. Kay's Restaurant is basically a bar with a dining room that serves simple sandwiches and a plate of nachos and cheese. Why bother with this small pub? Because of the Steak Sandwiches. If they're not world famous, they should be. The menu is the first indicator that this place isn't a normal restaurant. You sit in nicely decorated settings that call more to an English tearoom or an upscale steakhouse rather than a simple sandwich shop. You sit and the waitress hands you... a napkin? That's right, simplicity is zen, right? Kay's nails it. They over standard sandwich meats; tuna, turkey, ham, etc. You want the steak. It's tender and perfectly cooked and compliments the buttery bun they serve it on. You then can choose toppings to go on top, ranging from lettuce and tomato to sauteed mushrooms and onions. Every sandwich is served with potato chips, pickles, and a pepperoncini. A simple sandwich with a perfect taste. The chips and salsa/cheese are a generic offering, and that's basically it for the menu. Perhaps some more variety could help? Still, the steak sandwiches are perfect. If you want a perfect steak sandwich, well I am repeating it for a reason. Kay's is located on 1013 Cass Ave in Woonsocket, RI, their phone number is (401) 762-9675. It is moderately priced, with everything costing about 10 dollars a person. Amid a sea of cheap Chinese advertised with tri-fold mailers shines a silver coin. Lincoln's Asia Grille maintains its reputation as best Asian food in Blackstone Valley. Asian can be a bit of a misnomer, since Asia Grille serves mainly American Chinese food, but the food is so delicious no one seems to care. The only really negative to this resturaunt is their name claiming to serve Asian food, despite a lack of overall pan-Asian cuisine (which could include Turkish, Japanese, Indian, Thai, and even Russian food). Easily excused with a bowl of their delicious Chicken Won-ton soup. So cheap yet so high quality you'll want to eat it daily. Wonderfully tender wontons float like koi in a delicious golden chicken broth. A slice of cured pork and chicken breast float with the dumplings, and it's finished with a leaf of lettuce, wilted by the heat. If you're feeling hungry, order the larger size with noodles for an extra treat. The entrees are mainly American Chinese favorites, like Chop Suey, Egg Foo Young, assorted flavored chicken dishes, and Lo Mein (a vietnamese entry, the Asian extension?). I've yet to have a bad meal, so I can't really complain about anything. Maybe their Egg Rolls aren't the best, but I tend to not like fried foods. Their Steak and Chicken Teriyaki are just amazing and make a much better (and healthier) appetizer. Service is always wonderful, with the staff being both knowledgable and helpful when managing through the massive menu. The bar was a tad small for a restaurant that size that also boasts kareoke, but then just give me a bowl of chicken wonton and I will forgive anything. Asia Grille is located at the Lincoln Mall plaza next to the Mall itself. A true gem is hidden on Woonsocket Hill Road in North Smithfield, Rhode Island. Wright's Dairy Farm peaks out down a winding country road. Pulling in, you see a sign stating "BAKERY IN BACK" followed by a small parking lot. The smell of farm in unique and sometimes quite putrid, though just quickly run inside the bakery away from the Mike Rowe 'Dirty Jobs' love fest, and you enter a confectionery paradise. First thing, the milk coolers stretch throughout the left wall containing hundreds of gallons of milk of all varieties. Why have all this milk? The massive bakery counter holding assorted sweet and savory pastries, with them all being very affordable. The true star is the fresh whipped cream that is just light years beyond anything available in the grocer's cooler. Seasonal items like hot cross buns for lent and Christmas cookies allow you to celebrate seasons the right way. Other products like the assorted fruit squares (my favorite is the raspberry) and cakes just blow the competition away. The savory selections are decent, but the sweets overshadow them. One thing the farm is missing is a place to sit and enjoy, perhaps featuring a small cafe. This would make the farm's bakery a perfect spot, since having the drive-home wait before eating such things is one of the worst forms of torture. Perhaps the best product are the small cup-sized milk jugs filled with regular, chocolate, or coffee milk. They're so fresh, you can taste buttery notes in the milk. Wright's Dairy Farm is located on Woonsocket Hill Road in North Smithfield, Rhode Island. They milk the cows daily and the milk is as fresh as hygienically possible. For another Market review, I head to scenic North Smithfield to visit Brigido's Supermarket located in the North Smithfield Plaza. The parkinglot was filled with smart-looking pinegreen shopping carts, looking different from the generic chrome or the sometimes ugly plastic carts. Inside I was welcomed to a wonderful collection of fruits and vegetables. Despite being a smaller than average marketplace, they had a wonderful collection of citrus and berries, and a plentiful selection of herbs. This market also had several stations of free samples, a great plus in anyone's book. The first was in the fruits and vegetable section, featuring a platter of chips and salsa. A tad generic, but it was free and good so I won't complain. The next set up was near the prepared dinners and fish section was a nice salmon pate with wheat thins. A little better, though the crackers did not match the spread. Finally, the small deli counter (which featured delicious Boar's Head meats) had a nice platter of cubed turkey breast. Brigido's was otherwise normal, featuring specials and generic IGA products common in local markets. The shopping lanes were quaint though the conveyors were short. They did feature a nice selection of organic and green products, though their coffee section was rather deficient. Brigido's Market is located in North Smithfield, Rhode Island off Victory Highway (route 102). They have a website and other locations. Not neccessarily worth driving to if you're far away, but you'll be pleased with it if you're there. If you want Pizza, go to Federal Hill and seek out Acorn Street, and go to Caserta Pizzeria. The sauce is amazing, their dough is perfectly cooked, and the toppings are a wonderful compliment and don't overpower the other ingredients. Too many places either put too much cheese or sauce, or it's just a delivery vehicle for 10 pounds of meat. 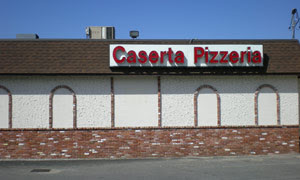 Caserta Pizza focuses on the zen of Pizza, balancing everything so it tastes like a pizza should. The restaurant is also known for their Wimpy Skimpy, a spinach pie stuffed with canned spinach, pepperoni, olives, and cheese. Why canned spinach over fresh baby spinach? It just tastes better and honestly sometimes you need a little canned spinach in a world filled with baby greens. The dough on the Wimpy Skimpy seems different than the other pizza dough, it comes out with a more french consistency, being airy and buttery. The exterior and interior may turn some connoisseurs off, but no authentic brick-oven pizza joint can ever replicate the texture and taste that Caserta Pizzeria delivers. It's located off Atwells Avenue on Federal Hill in Providence, Rhode Island. They only take cash but have an ATM on site. Hidden away in Cranston, Rhode Island is a true culinary gem. When you approach the parking lot you can appreciate the food you're about to eat by the sheer volume of cars. Inside you're confronted with an ordinary looking lobby, but don't be fooled. What awaits is perhaps the best food in Rhode Island. It takes a truly good recipe to make Meat Loaf desirable, and Twin Oaks does it. There is a reason they sell out early on the special days they serve it (Tuesdays and Saturdays, mark a calender). If you want thanksgiving, go with their full turkey dinner, you'll want to undo your pants and watch some football afterwards. Their steaks are perfect and the pasta dishes are to die for. There's really nothing bad about Twin Oaks, except maybe the wait. They have over 4 dinning rooms yet still they fill up to an hour+ wait. Here's a secret, find a spot at the bar and order there. Same food, easier seating. If you do manage to get a seat, ask for a waterfront view for a breathtaking meal. Haruki is a top-rated Rhode Island Restaurant serving Japanese cuisine. It has several locations and constantly wins awards. I've already reviewed and rated what I consider prime Japanese cuisine in Rhode Island, Enn Sushi and Japanese Restaurant. Please refer to this link for any unknown Japanese terms, which I have italicized. With every Ying, there must be a Yang. That Yang was Haruki. First, the restaurant itself is subpar. The interior looks like it could be any cuisine. It just felt dirty and worn. Now this could be forgiven had the food and service been exceptional. I have had excellent food in places that are 'dives', but Haruki is an all around dive. The service was abysmal. Me and my wife waited too long for drinks, and the appetizer which we ordered with the drink came 13 minutes after the drinks (20 minutes in total). I then was never offered a refill, instead having to ask for it despite my glass sitting empty well after our meal had arrived. The food left much to be desired. We ordered Gyoza, which were floating in soy sauce. This is bad for a panfried dish, especially in a salty liquid that just leeched into the meal. It transformed the dumplings into salty and soggy messes. Then we shared a bowl of Udon, which tasted like mass-produced noodles in a broth which should not have been served. Our main dish followed, and was small and somewhat unappetizing. The sushi and sashimi served with the main course were decent, but the rest of the dish was too small and tasted like something served at Applebees. We then paid much more than it was worth, and left still hungry. Japanese food is expensive, but there are much better options that offer better food for much less. And service should only be mentioned if it is poor, because that can affect a meal much more than the cooking. We visited the primary location in Cranston, though there are different locations throughout Rhode Island. They also have a website, except upon posting this Google has warned me that the website could harm my computer. I'm going to post it anyways in case the malware ever is removed. It's nice to see the website perfectly tell you what the restaurant is like. Note: I will use some Japanese terms, which will be highlighted in italics and accompanied by translations in parenthesis. Rhode Island is known for its Seafood, Italian and Portuguese cuisines. Japanese, however, often escapes the grander culinary reputation. Admiral Perry came from Newport, and he opened relations between the United States and Japan. Rhode Island also shares the intensity of seasons celebrated in Japanese culture. Yet, to find a good piece of sashimi (thinly sliced raw fish) or some tender gyoza (dumplings), you had to venture to either Boston or New York City. Enn has filled the void. Upon seeing the restaurant offering an 'open soon' sign west of Lincoln Mall, it piqued me and my wife's tastes for authentic Japanese food. We had bad experiences with some of the other local establishments, with them either being too theatrical and American, or simply just not good. Enn offered rebirth as it opened in Spring. Inside, Enn presents Japanese simiplicity and elegance. The restaurant was clean and wonderfully colored, offering a beautiful view of Lincoln's rolling hills and dense forests. A small lounge slightly seperated from the main dining room and sushi bar holds a quiet elegance and a nice television set. I must catch a Patriots game there while enjoying a sampling of sushi. Our first meal consisted of gyoza, sashimi, and sushi (raw fish served upon or rolled with rice). Our sampling of appetizers revealed a potent kitchen capable of producing high-quality Japanese food for a modest price. The gyoza were perfectly cooked, stuffed with meat and vegetables. The dumplings had a wonderful crust on one side and a wonderfully tender other side. They served a small sampling of spices and a small bowl of dipping sauce that wonderfully complimented the other flavors. Next, I received a modest sampling of nigiri sushi while my wife sampled their skill in producing sashimi. Both dishes featured fish served at the perfect temperature, and each piece was tender and delicious. Our next meal involved us ordering lunch, which we ordered gyoza, sushi, and sashimi again. They maintained the quality and surpised us with offering the fish with a bento-style Japanese lunch box and a bowl of Udon noodles. Udon are thick wheat noodles served in a savory broth. The bowl and dish were works of art that had a wonderful flavor. We were served a second soup dish because we ordered the lunch, and what came out of the condition surprised us both. Neither me nor my wife ever enjoyed Miso soup, until we tried Enn's. The delicate umami (savory flavor) mixed in a perfectly seasoned broth. The lunch was then brought out, and to our surprise, contained special appetizers. This is common and they change daily, bringing variety to the meals. The salad served was rather normal and served with the traditional ginger dressing, but the understated gem of the lunch was a small offering of Japanese relish, different from the stuff Americans put on their hot dogs. At the end of the meal, the waitress told us the chef was perfecting ice cream flavors including; green tea, azuki (sweet red bean), and ginger. We've since had the green tea, and despite it being served with a dollop of too-sweet cool whip, the ice cream was perfectly chilled and wonderfully flavored to balance the sweetness of ice cream with the bitterness of green tea. They also serve a unique fried vanilla ice cream 'breaded' with granola and flavored with a sweet plum sauce. Japanese food may be scary to someone who has never encountered it, but trust me in that this is where you want to try it. I've spent alot more for a lower quality meal, though Enn is moderately priced. Art is never cheap. Enn is located on George Washington Highway in Lincoln, Rhode Island. They have a website with a full menu, though specials are best inquired about either by phone or in person. Rhode Island offers a plethora of Supermarkets and Discount Warehouse clubs. When I heard of a locally-owned retailer offering top quality food, me and the wife agreed that we needed to explore this potential hidden gem. We headed off to the market to explore. Unfortunately, Dave could not live up to our the great expectations. A Marketplace implies a great selection, something I did not see. Other markets offer rare fruits and vegetables, and Dave's only offered common selections. What was worse, the price for the common fruits and vegetables exceeded what I originally considered pricey. I did find some interesting Jams made by Massachusetts Trappist monks, but there was not a wide selection of local ingredients and locally produced goods. Dave's offered free coffee, something I did enjoy. It was perfectly brewed and had a wonderful flavor. Free coffee, though, does not excuse grossly overpriced products. Now my experience is only limited to the Cumberland location, so please don't hold the entire franchise to my review. I do not know if all locations suffer from what I consider faults, but I doubt that the store in North Kingston or Warwick differ that much. I might venture to Dave's again, but there was nothing there to make me want to go. There were no rare products not available anywhere else nor were the prices worth the extra drive. Aside from these nitpicks, the place was clean and all of the food looked wonderful. A first review says much about a person, like a first impression. What is reviewed and when says what the person's behavior and tastes are. My first review covers not a five-star brasserie or a chic sushi bar with an award winning sushi-ya. Summer in New England can be harsh. Memorial Day has passed, so popular opinion dictates that this is officially summer. 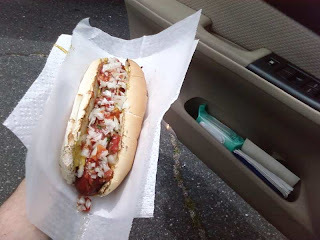 I had just bought a air conditioner and was on my way home, and I spotted a hot dog truck. This is not the New York-style cart with a seedy gentlemen roasting a row of mystery meat sausages. The smell hit me first, even in my car; roasted hickory logs and the sweet smell of beef. Then I noticed two men devouring the hot dogs on those plastic patio chairs that everyone seems to have. A tad hungry, I decided to stop to see what it was. What I encountered has put Oscar Meyer to shame. The chef, a former Navy Engineer, stood behind a large propane grill mounted in the back of his truck. Where did the hickory smell come from? He told me, it was a combination grill that used propane to regulate the heat (Hank Hill would be proud) and allowed for wood to be added for extra flavor. I ordered the Big Dog, an apt label. He pulled a half-pound all-beef meat log out and began to smoke it over the roasting wood. He added the bun to the flames and began to talk about what he was doing. Once cooked, he split the dog down the middle and offered his selection of toppings. He had Pico de Gallo (Salsa for the gringos), all-meat chili, sweet and hot barbecue sauce, and the New England classics of Mustard and Onions. I picked mustard, onions, and salsa. I paid my $6.75, and walked off to enjoy. Definitely a good decision. The smell was wonderful and the taste did not disappoint. I devoured the sausage much like the others outside the truck did while mine grilled. I never expected to find such a treat in Bellingham, but pleasant surprises are one of life's great joys. The one problem I did have was the mess, but the Hot Dogs are not a nice meal to be eaten with linen napkins and silverware. The best part was the smell in my car after I finished eating to drive home, a much better fragrance than 'New Car' or 'Ocean Breeze'. Larry Joe's New England Fire Pit is located on Route 126 in Bellingham, across from the Outback Steakhouse/Home Depot Plaza. It's a big white truck in the parking lot of deli/liquor store. 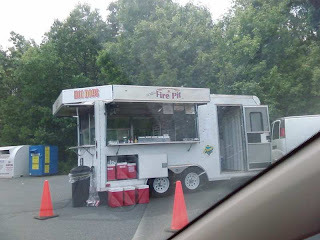 The Chef serves only hot dogs and cans of soda, but the toppings make each experience unique. Look up the 'Fanatic fans of Larry Joe's New England Fire Pit' group on Facebook if you enjoyed the meal. Hello and welcome to Rhode Island Epicurean. I am the RI Epicurean and I will be your guide to food in the greater southern New England Area (and parts of South Florida that I visit). I am gourmet and conscientious eater. We should all eat good food (but maybe not overeat). My reviews are based upon my own taste and my own experiences at a particular establishment. Whether this is a restaurant, snack stand, or even a supermarket, I will rate everything on the academic scale (A is the best, F is just horrible and should never be approached). Feel free to comment and challenge my reviews!